I've been rocking hair extensions ever since I could afford them. This was when I got my first job at 17, making that 10+ years now! I've worn all types of hair companies, lengths and styles and have finally gotten down to my favorite look, brand of hair and hair stylist. As I've gotten older, I've become more and more comfortable with my large, Tyra Banks sized forehead and am not afraid to show it! This is why I rock my off-center part with medium layers on top and longer layers through the bottom. My hair extensions are sewed in through a full-basket weave with a small amount of leave-out on the top and sides. I found a great tutorial here that best displays a similar technique to how my hair is sewn in. This entire process takes about 2+ hours with an hour for take-down before and styling afterward. I've tried tons of brands of hair and have become loyal to Runway Riches. Runway Riches is a hair company run by Tracee Smith out of Dallas, Texas. Not only is she fabulous but the hair is too! I'm constantly amazed by the quality and longevity of the products and customer service of the company. Tracee offers Bundle Deals where you can purchase 3-4 bundles together at a discounted price. My only wish is that you could custom order bundles & mix up different lengths. However, I don't mind paying a little bit extra to get exactly what I want. This hair is 100% worth it! Wear & Quality - This hair does not shed or tangle outside of normal conditions - when it's brushed after being curled & hair sprayed. I use a wand and strong holding spray to keep this hair curled. When the day is done & it's time to brush it out, there's a small amount of fall-out but nothing that takes away from the fullness or quality. Otherwise, you can run your fingers through the hair with no shedding or tangling. I fully curl my hair 2-3 times a week, meaning most days only require touch ups. This hair holds it's shape! Not much heat is required. It also forms to it's natural loose wavy texture after being washed. I love the Peruvian texture because it matches my natural hair best. I rarely have to worry about the hair not blending into my own. Longevity - This hair is incredible for it's longevity. All of my bundles have lasted at least 6-12 months. The only time I feel like it's time to get a new set of extensions is to add length of fullness, but never due to the condition of the hair after a long time of wear. Cost - You can't beat the cost of this hair because it's so high quality. The bundle deals also make this hair very affordable. If you're looking for an even deeper discount, follow Runway Riches on Instagram for promotional codes and sales. If you're looking to purchase this hair from Runway Riches, you can get 10% off using my discount code samloveglam. Processing & Shipping Times - If you're looking to buy your hair quickly, whether you have an upcoming event or appointment, I know how crucial it is to know how long it's going to take to receive your hair. The total time it takes after purchasing is about 3-5 days. Of course, times may vary. If you have questions about shipping costs and estimates for Runway Riches, check here. Precious Morris is my hair stylist out of Houston, Texas. She is located 2.5 hours from Austin and is worth every second of the drive. When you find someone you love, you go the distance! Precious focuses on natural hair + styles. She is fast and focused on her clients. Most of my appointments are no more than three hour from start to finish. I always leave feeling fabulous, both my hair and wallet. Her prices are fantastic for the work that she does. I will not be going to another stylist! You can review her prices and book services on StyleSeat.com or follow her on Instagram to see all of her work. Q: How many bundles do I need for an entire look? A: For a full-head of extensions, I'd recommend 3 bundles at minimum. Currently, I'm wearing four as previously mentioned for fullness and to maintain the long length. Q: How often do you get your hair done? A: My hairstylist, Precious, recommends I take down & re-sew in my extensions every 3 months. Because I live a couple of hours away, I extend my visit to the salon every 3.5-4 months. Q: How often do you wash your hair extensions? A: I wash my hair extensions once every two weeks. Because the hair is already dead, there is no need to over-wash & condition it. Q: If you don't wash your hair extensions often, what products do you use? A: The only products I use in between washes are an oil sheen mist on my leave out/natural hair and Chi Silk Infusion on the extensions. If my natural hair gets too dry, I'll use a tea tree oil. I've learned the less product, the better. Q: Do you relax/chemically straighten your leave-out? 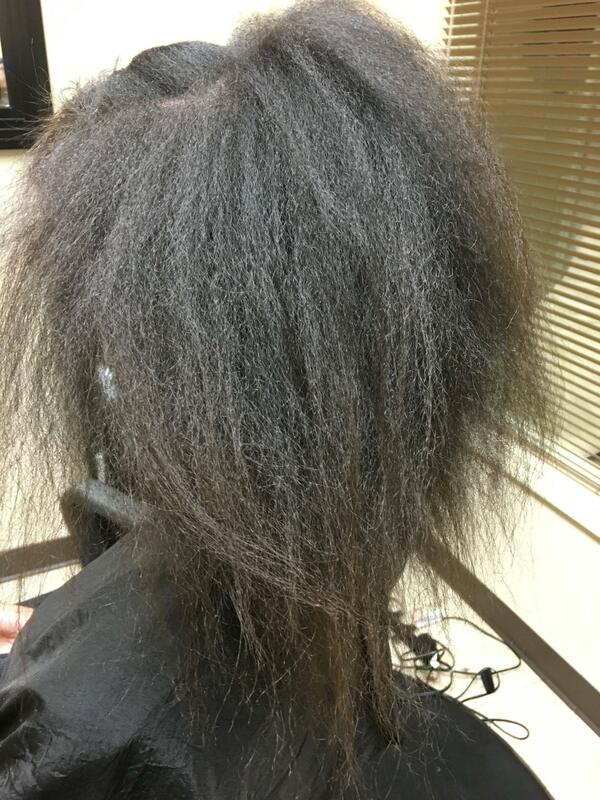 A: Yes, I do relax my natural hair but my stylist does not. Precious focuses on natural hair and doesn't relax it at the salon. To ensure my natural hair easily blends with the extensions, I relax my leave-out about once every 3 months. I once used a relaxer every six weeks but now only once during the time my extensions are installed to keep them looking natural and blended. You can relax your hair every 4-6 weeks depending on the texture, but my hair stylist has gotten me on the road to more healthy hair by not abusing harsh chemicals. Q: Are you ever going to wear your natural hair? A: Not anytime soon. From personal experience, wearing extensions has been the easiest upkeep. If I don't want to worry about styling it, I can throw it in a ponytail. If I don't want to curl it, that's OK.. the hair is naturally wavy and can be worn natural. Q: How long is your natural hair? If you have any other questions, leave a comment! If you enjoyed this post, learned something new or felt inspired please like, comment, share or subscribe. I created this blog to share what I'm passionate about, and that is beauty – make up and fashion. My goal is to inspire you, answer your questions and hopefully teach you something new. If there's something in this world you love, share it. Take the things you feel good about and use it to connect others around you. And that's why I'm here to share why I, Sam, love glam.